It's become a tradition for The Biggest Loser contestants. Before every season finale, Chef Devin Alexander invites contestants from previous seasons to reunite at her home for a scrumptious meal that she and her affable team prepare. 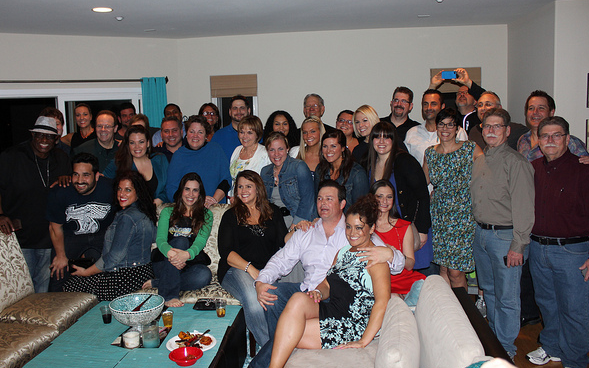 This year, a couple of us staffers from RealityWanted attended Chef Devin's shindig. 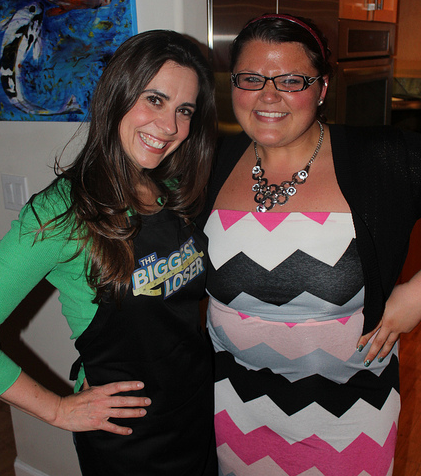 In between savory spoonfuls of turkey chili and hearty bites of poblano peppers, we discussed The Biggest Loser's impact with some of the evening's guests and the chef herself. Q. RealityWanted: When did your affiliation with The Biggest Loser begin? A. Chef Devin: I started with The Biggest Loser in 2006 during Season 3. They asked me to write their first cookbook, and I was also on the show that season promoting the book. Q. RealityWanted: How did this tradition start where you invite several contestants back to serve as a family reunion? A. Chef Devin: I get so much inspiration from the contestants. There's just a comfort being around people who've gone through the same thing, who are going through the same thing. So I feel so blessed to be a part of this family. The first couple years that I was affiliated with the show, they were having the reunion, but they were doing it in a restaurant. And without fail, you know how that goes in a restaurant. Somebody has a ton of money. Someone has none. Person X orders 4 bottles of wine, and they can afford it, and Person Z is stuck. So some people would go, ‘Oh, I'm not eating.' And then finding a low-fat restaurant was a thing. On top of that, since the contestants were all together, they were stalked. I had watched them do that, and many years ago, I was doing a restaurant partnership, and then the restaurant I was doing it with said, ‘Hey, do you want to bring them here?' So I did, and then when I extracted from that partnership, it was at a time where the reunion was coming up, and the company still wanted to do it. And I was like, ‘Oh, I don't know.' So I invited everybody here. And I didn't know if anyone was going to show up here. A lot of them did, but nothing like today! It's just gotten so that a month and a half out before every finale, people will ask, ‘Are you doing your party?' And I'm like, ‘Sure, I guess I am!' And now Jennie-O provides all the turkey, because they're a show sponsor, and then Melissa's/World Variety Produce is just awesome. I just gather everybody in a place where they can have fun. Q. RealityWanted: Can you talk about the digital presence you have? A. Devin: This season, BiggestLoser.com has gotten bigger and better. Dolvette has a whole series of workout videos, and I have smart cooking tips. These are tips like what to look for when you go grocery shopping and how to make your produce last longer, because it's so important to use herbs in your cooking to save calories. Q. RealityWanted: How did you become a part of The Biggest Loser? A. Jen: I followed the show from Day 1. I watched the challenges and thought, ‘Hey, I could do that.' I tried out for 3 seasons. I went out for 9, 10, and I guess the third time's a charm, because number 11 was the season that my dad and I got cast. Watching the show and seeing myself in the contestants is what brought me here. People that I watched throughout the seasons are now my family. Q. RealityWanted: What was the largest difference between doing what you were doing at home and what you did at the ranch? A. Jen: The around-the-clock workouts at the ranch were the craziest parts. While on the show, I learned what I could fuel my body with that would help me during the workouts and after. Q. RealityWanted: What convinced you to sign up for The Biggest Loser? A. Courtney: I went to the Season 7 and 8 finales. I was a huge fan and was very inspired by everybody that was on the show. And I actually lost 112 pounds before I was on the show. Biggest Loser started calling me about it, because I had tried out a couple times. And I said, ‘Ah, I got this. I don't need you guys.' So I actually told them ‘no' a couple times before I finally said, ‘If I don't have to send you another video or another application or another picture, I'll go for it.' So I didn't have to send them anything else for Season 11. I lost another 110 on the show. So I've lost about 230 altogether. And I still have another 30 I'm working on. Having this family that we have is so awesome, because we are accountable to each other. That's a huge part of this. Q. RealityWanted: What digital applications do you use to help keep you on track? A. Courtney: I use Body Media. We love our Body Medias. They're awesome. They actually sponsor the show. But really, for us, I used mine before I was ever on the show. I've had mine for 4 or 5 years now. And I also use My Fitness Pal. You log your food, and that keeps me accountable. I won't go get a Reese's Peanut Butter Cup, because I don't want to put it in My Fitness Pal. It's one of those things that really does keep me accountable. Q. RealityWanted: What process did you go through while being on The Biggest Loser? A. Mike: I was on the ranch for two weeks and lost 20 pounds. Then I got voted off. I went home a little bit angry, hurt and devastated, because I felt like it wasn't going to happen for me. I wasn't going to lose the weight. They said that I didn't work hard enough. That the second week I just didn't give it enough, and that was the reason why I was sent home. I went home, and I re-evaluated. I realized that if I did well and finished strong, I could help other people and do something that I was passionate about - which was weight loss. I'd always wanted to lose weight. I'd been heavy my whole life - from 12-41. So it's the only thing that's ever been on my mind. I lost 160 pounds in total on the show. I'd already lost an additional 12 pounds before I got on the show. Q. RealityWanted: How have you used your victory to elevate your life to the next level? A. Mike: After winning the show, I went to Dr. H (from The Biggest Loser) and told him that I'd thought about making the model of a Biggest Loser-type experience in a residential setting. He said that he had thought about it for years as well. I was watching Biggest Loser when I was close to 400 pounds, and I thought if I was to lose all this weight, maybe I could do something like a residential-type care home. I could have people come live there who want to lose weight and take them away from society like they do on the Biggest Loser ranch. I could teach them to lose weight. And then I got picked for the show. After talking with Dr. H, he's the one who put it all together. He put The Clinic by Dr. H together, and now I'm working with him. People come there for 2 weeks and learn how to do what we did in a really healthy and really smart way. It's teaching people how to eat and workout correctly. For additional health tips, recipes, tools, and more from Chef Devin Alexander, please visit BiggestLoser.com.